So I was working on a config and suddenly noticed that the disk was full and the vm halted! Now I was stunned to notice this. Usually I like to keep my disks at the 20% buffer that vmware recommends. On examining the log, I see that a clone that was taken earlier failed as it timed out. And, knock knock, there was a snapshot that was left running! A refresher, the process of cloning involves taking a snapshot of the vm, then doing a block per block copy of the original vmdk and then committing the snapshot which records the delta changes. 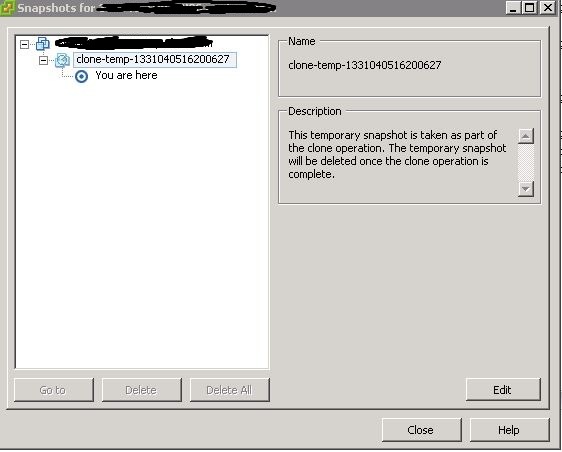 In this case, the snapshot was not committed after it was noted that the clone had failed. Since the vm was powered down, I went ahead with the delete all option and committed the snapshot which freed up a ton of space. Also remember, its safer, in my opinion to power down a vm in order to commit a huge snapshot. Post comments if you want to further discuss! Next No HA over two separate ip subnets?